As far as we are concerned, when it comes to sweets, it doesn’t get much better than a good old fashioned cookie. A well executed cookie is a beautiful thing. It has to have just the right amount of sweetness, a touch of salt, a little crunch, and a perfectly chewy center. The best of the best are deceptively simple creations. These are the ones that have been tweaked 100’s of times until there is just the right amount of everything, while at the same time not being overly complicated. Because no one likes a fussy cookie! Often times, they are family recipes that have been passed down from generation to generation, and are closely guarded secrets. Mmmmmm, secrets. Aside from being extremely well-balanced and very tasty, this recipe is barely any of the other things mentioned above. Heck, it’s barely even a cookie. Because honestly, for as much as we love cookies, we are also pretty fond of brownies. When we couldn’t decide between the two, a recipe was born. Not a family secret. Not the culmination of 100’s attempts at perfection. Not really a cookie. Not exactly a brownie. Just chocolatey, chewy, sweet, salty, and delicious. So, if any of these things sound good to you, we think these might be just your thing! Enjoy. In a large bowl set over a saucepan of simmering water, melt half of the chocolate chips with half of a stick of butter, stirring a few times, until smooth, about 7 minutes.Set aside to cool. Meanwhile, combine other half stick of butter and sugar in bowl of stand mixer (fitted with paddle attachment) and cream for about a minute. Add eggs, one at a time and beat on medium-high speed for about five minutes. Add vanilla. Beat on low to combine. 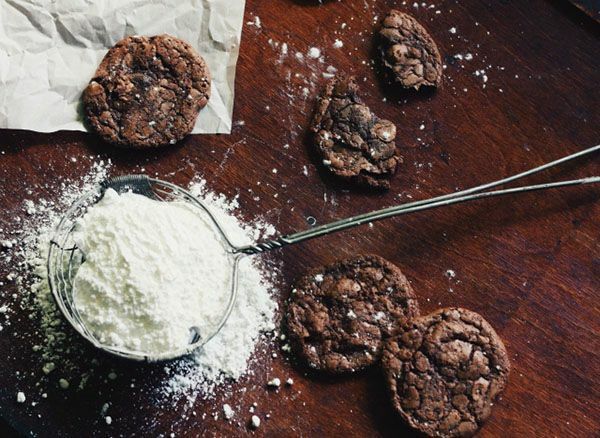 Combine flour, cocoa, baking powder, soda, and salt. Whisk well to combine. Fold in chocolate mixture into egg mixture. Fold in flour mixture. Fold in remaining chocolate chips. Place dough in freezer for one hour, or alternately chill dough in the fridge overnight. Line cookie sheet with parchment paper. Drop cookie dough by tablespoon onto cookie sheet, leaving two inches between each cookie. Repeat with remaining dough. Place in freezer for 5-10 minutes before baking. Bake for eight minutes. Let cool slightly on cookie sheet. Enjoy! Want more Tasty Bites? Go here. Also, if you are on instagram, be sure to follow@birdandclever for more stunning photos.